Experienced professional with compassion for the natural world and extensive education and experience in reforestation and environmental plantings; invasive species management, Green Infrastructure plantings and maintenance, environmental habitat restoration including vernal pools, microtopography, and wildlife management. Lynette graduated from University of Maryland with a Master’s of Science, Animal Science – Wildlife Habitat Management and a Bachelor’s of Science, Natural Resource Management. Career professional with field education and extensive experience in development and project management. Eric’s detail-oriented management practices, through all phases of the project, provides the client a quality end-product, meeting all specifications and requirements while completed safely and remaining on schedule. Eric graduated from SUNY Cobleskill, Bachelor of Science, Animal Science – Wildlife Management; AAS – Fisheries and Wildlife Technology. Proven career sales manager with estimating experience in environmental restoration planting and construction. Bill’s success in client relationships supports the General Contractors to easily meet their MBE participation goals while maintaining a high level of responsiveness, timeliness and quality product. Bill graduated from Plattsburgh State University with a Bachelor of Science, Environmental Science. AAS in Horticulture. Sean's experience and education has helped facilitate and support a seamless transition during Empire's unpredicted growth. He continuously strives to build his knowledge and experience within the green industry while sticking to his principal and unflawed characteristics, of ethical and professional decision making. Sean joined the Empire team in January 2015 and graduated from Marymount University with a Bachelor's degree in Business Administration, specializing in both finance and accounting. Alex's love of the natural world, comprehensive understanding of environmental restoration processes, and client-first approach has been instrumental in the growth and development of Empire. Through hard- work and dedication, he continues to grow his professional skills and strives to stay at the forefront of an evolving industry. Alex serves as a knowledgeable resource for clients, providing experience based insight while managing projects. Alex joined the Empire team when it was first established in 2005 and studied Horticulture and Business at the Community College of Baltimore County. Emerging career professional with several years of field experience with a passion for preserving and reestablishing natural ecosystems. Zack is accomplished in Natural Resource Management while specializing in invasive species management, bioretention restoration, and Green Infrastructure practices. Zack joined the Empire team full-time in 2017 after obtaining his Bachelors of Science in Environmental Science from UMBC. Steven has been working in the Environmental Restoration industry for 10 years. He joined the Empire team in 2015 as a laborer and has worked his way up to Foreman and now Project Superintendent. His love for the outdoors and passion for the environment make him an excellent fit for Empire. Steven is a friendly, knowledgeable, and honest person who knows how to communicate with crews, clients, and contractors to make sure the job is done safely and per the specifications. With his positive, hardworking attitude, Steven continues to grow and develop his skills every day. Career outdoor and environmental educator, utilizing those prior skills to establish a second career in environmental planting and restoration work. Joe is keen on developing relationships with straight-forward and honest communication while demonstrating a knowledge of the native plant material used in restoration and Green Infrastructure projects. Joe joined the Empire team in the summer of 2017 and graduated with a Master's Degree in Environmental Biology from Hood College and an Undergraduate Degree from McDaniel College. David has a strong background in excavation and heavy equipment operation, previously working on large scale projects in and around the DC Metro area. With his 12+ years of field experience, he has gained a strong understanding of environmental restoration practices, proficiency in erosion and sediment control implementation, and a robust comprehension of bioretention construction and maintenance work. 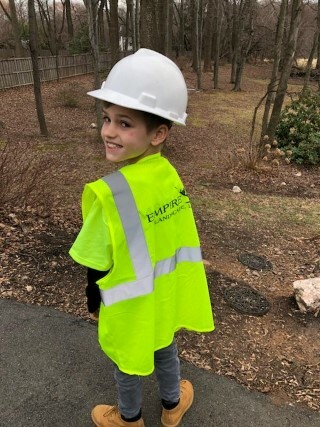 The wealth of field knowledge and experience that he brings to the Empire Team allows him to successfully manage all phases of a project from start to finish. David understands the importance of building and maintaining strong working relationships with contractors, clients, and inspecting agencies. This enables him to incorporate a team-work approach to his day to day responsibilities which leads to the long term success of his jobs and the satisfaction of everyone involved with his projects. Experienced arborist of eight years with a passion to preserve and appreciate the outdoors and the environment, as well as extensive operating skills with machinery, trucks, heavy and light equipment. Blake's organization and abilities in planning and executing environmental plantings, erosion and sediment control methods, and clearing projects, provides the client a well supervised project. Seasoned horticulturist with enthusiasm for ecology with eight years of experience in nursery production such as; propagation, container and field grown ornamental and native plants, plant identification, disease and insect diagnosis, IPM treatment practices, and maintenance of new and established plants. Liz's horticultural implementation experience includes residential, commercial, screening, orchards, raingardens, stream restoration, bio-retention, wetland, and reforestation. Liz joined the Empire team in the summer of 2017. She graduated from McDaniel College with a Bachelor's in Biology and Environmental Science. Career professional with 10 year's of experience in all phases of environmental restoration. Mike's responsibilities range from production management to safety and fleet maintenance. He organizes and maintains Empire's production schedule to meet project deadlines for all clients. Mike oversees production crews with the motto: "Safety is no accident!" Scott has a strong view about vital environmental issues by working to restore habitats for ecological services, human enjoyment and native species. As an avid birder and naturalist, he is experienced in plant identification and the safe use of herbicide application to manage invasive species. He brings several years of field experience to Empire and continues to grow his knowledge and skills. Scott started with Empire in March 2017. He graduated from the University of Connecticut with a Bachelor's degree in Communication Science. Scott continued his education at Colorado State University, and obtained a Master's Degree in Natural Resources Stewardship with an Ecological Restoration Specialization. A diverse and experienced professional with a passion for the protection and restoration of the environment. With 13 years of field experience focusing on arboriculture, soil stabilization, erosion and sediment controls, and reforestation, his knowledge has allowed him to effectively oversee many operations, including, but not limited to; site restoration, project scheduling, material purchasing, personnel development, and client /contractor relations. Business professional focusing on growing and managing relationships with new and existing clients. Karen's responsiveness, ability to meet deadlines while providing necessary documents in a timely fashion, allows a unified transition from the bidding phase to the implementation of a new project. Karen joined the Empire team in 2012 and graduated with a Bachelor's of Science from University of Maryland and an AA Degree in Business Management. Steve’s love of plants and the environment stems back to the years of his youth. After obtaining a BS in Ethnobotany from Frostburg State University, Steve followed this passion and turned it into a career. He is extremely knowledgeable in plant ID and preservation and has worked in the invasive plant removal field for nearly a decade. Steve brings a unique blend of education and experience to the Empire team. As one of the newest members of the Empire team, Sarah brings her love of nature and wildlife into fruition by working closely with county schools and parks to establish environments for the community to admire and enjoy. She is gaining critical experience in invasive species management along with native forest and meadow reestablishments to ensure a prosperous and self-sustaining environment. Sarah obtained her Bachelors of Science in Environmental Biology from Towson University. She worked in the University greenhouse, which allowed her to deepen her passion for growing and caring for many diverse species of flora.